Researchers have developed flower-shaped magnetic nanoparticles that are highly sensitive to magnetic fields. This increased sensitivity may enable hyperthermic treatment of deeper, harder-to-reach tumors. Hyperthermia involves heating tumor cells above a temperature they can tolerate. This therapeutic method is dependent on targeting cancer cells very specifically, since healthy tissue can also be destroyed by heat. One approach to localized hyperthermia is the application of magnetic nanoparticles that heat up when a magnetic field is applied to them. To localize the therapy, nanoparticles are made to be preferentially taken up by the tumor, which leads to a higher concentration of nanoparticles in the cancer tissue than the surrounding healthy tissue. There are commercially available nanoparticles for this application, but unfortunately, they require a significant amount of magnetic energy to be activated. Magnetic field strength decreases rapidly as distance from the source increases. In some cases, the some tumors are deep enough below the surface of the patient’s body to weaken the magnetic field, decreasing the technology’s ability to activate magnetic nanoparticles in a tumor. 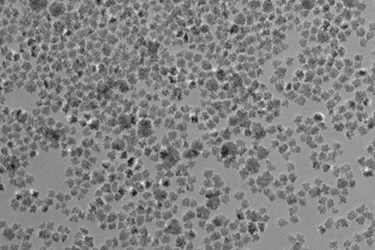 To overcome this limitation, researchers at the Dartmouth Center of Nanotechnology Excellence recently developed a new, more sensitive magnetic nanoparticle, according to a recent press release published by the American Institute of Physics. 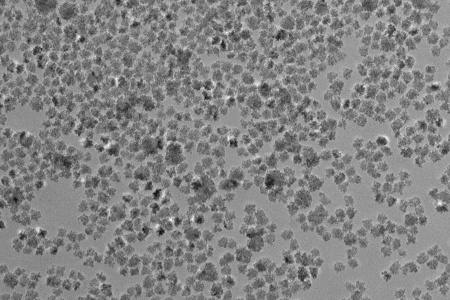 The new nanoparticles consist of single crystals of gamma-Fe2O3 and have saccharide chains that extend out from their surfaces, according to a recent study published by the team in the Journal of Applied Physics. The saccharide chains extend out from the crystal, forming flower-like aggregates that are about 20 to 40 nanometers in diameter. The saccharide chains help the particles stay suspended in solution and increase their shelf life to greater than 12 months. The most significant breakthrough, however, is the fact that these new nanoparticles are much more responsive to magnetic heating. Magnetic field strengths as low as 100 Oe (oersted) at 99 to 164 kHz are very effective at transferring energy to the nanoparticles. Because lower field strengths can induce effective heating, the flower-like nanoparticles can be further from the magnet and still effectively deliver heat. This may enable treatment of deeper tumors, like those found in the pancreas or certain colorectal locations. Effective hyperthermia depends on preferential delivery of the nanoparticles, as well as activation once they are in place. While the Dartmouth team uses magnetic energy to activate their nanoparticles, other teams have had some success at nanoparticle activation by using infrared energy, according to a recent article on Med Device Online.